I think it's safe to say May was a month of beauty indulgence. I spent more time pampering, spent longer doing my skincare routine both morning and night after realising just how much happier my skin looks when I take the time to really massage my skin, and become besotted with a couple of old favourites which are perfect for spring and summer. There's 2 skincare products which really stood out for me throughout May, both products are ones which I use both morning and night, both of which show benefits to my skin within days of use. With continued use these products have left my skin amazingly happy; clear, naturally radiant, looking fresh, young and revived. 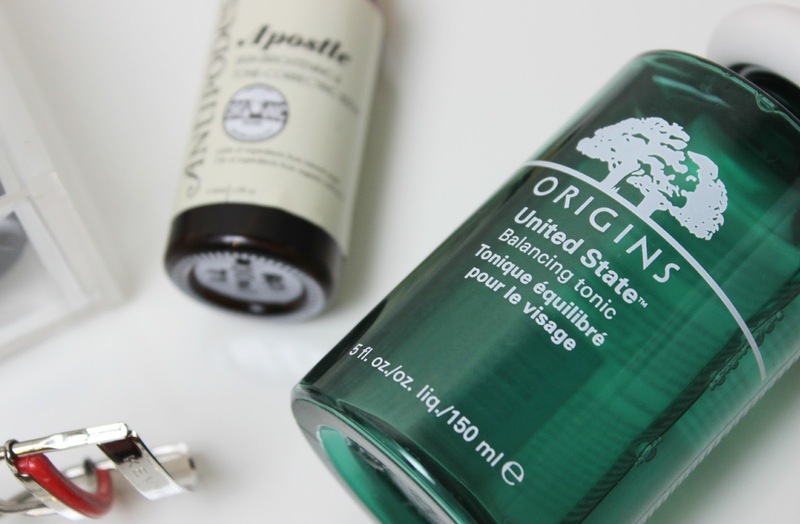 The Origins United State Balancing Tonic (£18.50, 150ml) is an amazing toner which does wonders for controlling my oily/combination skin. It feels instantly refreshing and soothing when applied, using state-of-the-art exfoliators which keep skin smooth and clear. There's Laminaria which works to control oiliness, Soy Protein which helps keep skin naturally balanced and moisturised, with aromatic Bergamot, Spearmint and Lavender. It does have a scent, but it's not overpowering and I actually find it very refreshing. Full review here. Antipodes Apostle Skin-Brightening and Tone-Correcting Serum (£35, 30ml) is one of a few products which completely revolutionised the way I look at skincare. I suffer with pigmentation issues, not just on my face but my body too, and it's always been an area of concern for me which left me feeling quite self concious. This serum is amazing and a holy grail product for me, as it massively reduces my pigmentation issues, leaving my skin looking and feeling more radiant and even in tone. It's pricey, but for me it's the best product out there for discolouration - and I've tried my fair share! I'm on my second bottle now, a product I would always repurchase. Full review here. SPF is one of the most important steps in any skincare routine, a product I use on a daily basis without fail. I've been trying a new SPF over the past couple of months and have to admit, I really adore the consistency of this one in comparison to thicker creams and balms I've tried before. The Clarins UV Plus Anti Pollution SPF50 Day Screen Multi-Protection* (£32, 30ml) is an incredibly light-weight fluid which is almost like a dry oil, in the sense that once massaged into skin it sets to a dry, matte finish. 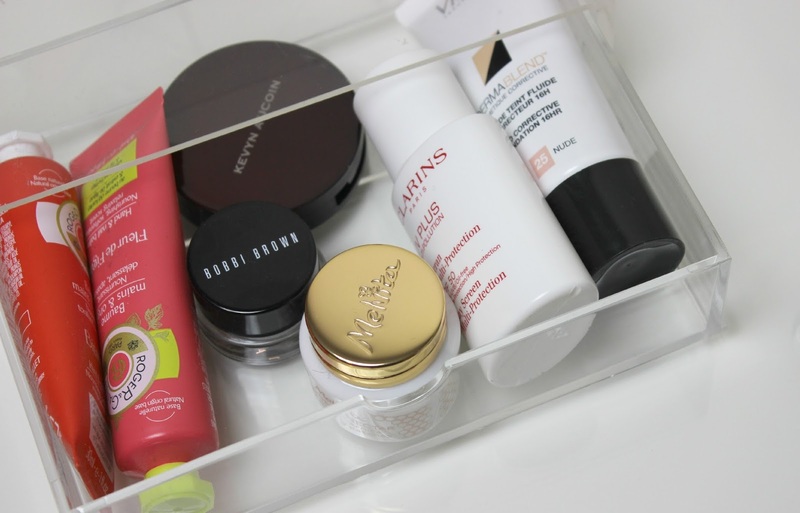 It works to protect skin against UV rays, pollution and free radicals, and works really well under makeup - a lot of SPF's I've used in the past can be quite greasy and make applying makeup very difficult, whereas this is super easy to work with. 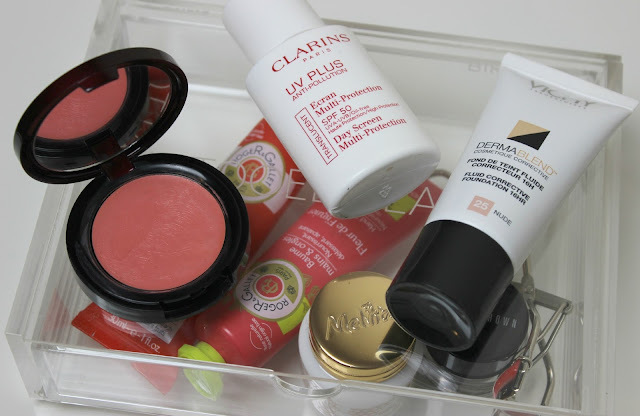 Of course our lips need pampering just as much as our skin and I am absolutely and utterly obsessed with the Melvita 3 Honeys Balm* (£10, 8g) which is one of the best nourishing, hydrating and softening lip balms I have ever come across. It has a lovely scent of honey without being overpowering, alongside a delicious hint of sweet orange. It's quite a thick balm, but a little goes such a long way and I use it all day everyday at the moment, especially before applying lip products to make sure my lips are smooth and ready for a pop of colour. Love, love, love! I recently shared a rave review of the Vichy Dermablend Fluid Corrective Foundation (£16, 30ml), and it is still by far my favourite base for everyday use. I am just obsessed with this foundation! The way it so effortlessly creates a flawless looking finish, without being too heavy or cakey, lasting amazingly well throughout the day and even working with well my oily skin - it's an amazing base I couldn't recommend enough! Full review here. Cheeks have had the perfect flush of colour with a product I had almost forgotten I even owned. Kevyn Aucoin The Creamy Glow (£22.50) in Tansoleil is the perfect shade for spring and summer, with an amazing cream formula that's super easy to work with and leaves a healthy glow with a soft demi-matte finish. Tansoleil itself is a gorgeous peachy coral that goes with so many different looks, a really flattering shade. For eyes I have been absolutely besotted with brown liners over the past couple of months and throughout May there was one particular brown liner I couldn't get enough of. I'm a big, big fan of the Bobbi Brown Long-Wear Gel Eyeliner (£18) range and 2 Sepia Ink is the most perfect deep, warm mahogany brown. Full review here. As someone who detests their flat, lifeless lashes, using lash curlers is an absolute must for me. I've tried so many different curlers over the years but the best by far has to be the Kevyn Aucoin Eyelash Curler (£17) which provides a quick and easy effortless curl for my flat lashes, which with a good mascara stays in place from morning to night. I also find the shape of these absolutely perfect, as it follows the natural curve of my eye. Last but not least and one for any fellow hand cream addicts out there. I use hand creams every day, all day. 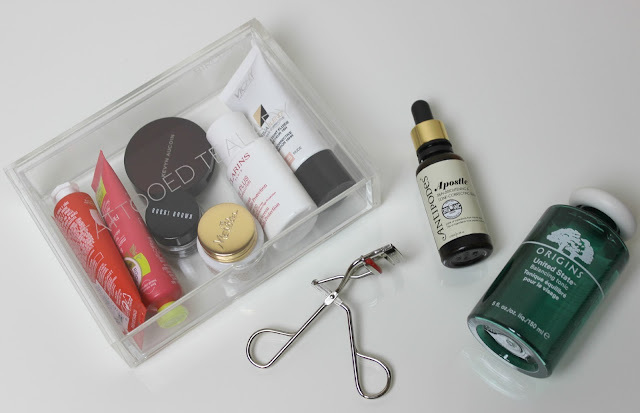 I like looking after my hands and cuticles, keeping skin soft and hydrated. Our hands are one of the first places to show the signs of ageing, and for me it's just as important as a good skincare routine. 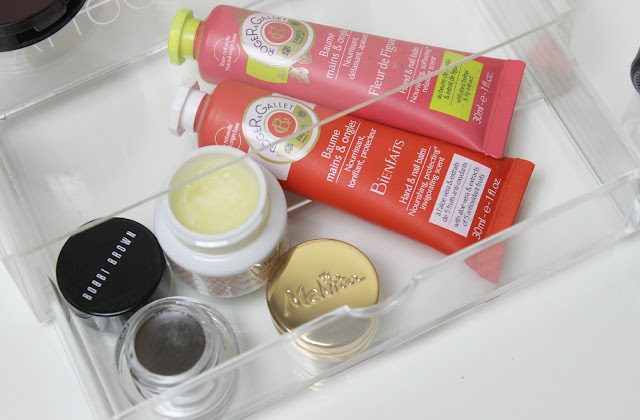 I've been using two new beauties throughout May, and they've already made their way straight onto my repurchase list! The Roger & Gallet Hand & Nail Balm* (£5.10) range is stunning, with two delectable scents that are heavenly. With shea butter and aloe vera, they work to hydrate, nourish and protect hands, with an added touch of apricot kernel oil for some extra pampering to hands and nails. They don't feel greasy, in fact they are fairly lightweight balms which once massaged in leave hands feeling instantly softer to the touch and over continued use have made a huge difference to how happy and hydrated my hands are. Fleur de Figuier is a beautiful fig themed scent, mouthwatering good, whilst Bienfaits has a tangy burst of blood orange. What products stood out the most for you in May? Will you be going for brighter and bolder shades now we're in June? I've been using the Bobbi Brown Sepia gel liner a lot too, paired with a neutral eye look. Apart from that I've used my Bobbi Brown shimer brick in beige a lot (new purchase), the Mayebelline Colour Tattoo in creamy beige, the Balm Fratboy blush, Kiko Modern Tribes Tri-Bal baked blush in Soul, the darkest colour is actually a really good bronzer for me. Other than that my Caudalia Huile Divine body oil, Korres Quince lip butter, The Body Shop Coconut Body butter. Glad to hear that! Wearing it today again with the gel liner and Fratboy blush! That blush looks gorgeous, and the skincare sound incredible. I definitely think I may have to test these out!